As electronics engineers, we always depend upon meters/instruments to measure and analyse the working of a circuit. Starting with a simple multimeter to a complex power quality analysers or DSOs everything has their own unique applications. Most of these meters are readily available and can be purchased based on the parameters to be measured and their accuracy. But sometimes we might end up in a situation where we need to build our own meters. 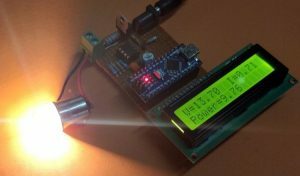 Say for instance you are working on a solar PV project and you would like to calculate the power consumption of your load, in such scenarios we can build our own Wattmeter using a simple microcontroller platform like Arduino. The complete circuit diagram of the arduino wattmeter project is given below. For ease of understanding the arduino wattmeter circuit is split into two units. The upper part of the circuit is the measuring unit and the lower part of the circuit is the computation and display unit. For people who are new to this type of circuits followed the labels. Example +5V is label which means that all the pins to which label is connected to should be considered as they are connected together. Labels are normally used to make the circuit diagram look neat. Further below let’s split the circuit into small segments so that we can get a clear picture of how the circuit is indented to work. Here the Input voltage is represent by Vcc, as told earlier we are designing the circuit for a voltage range from 0V to 24V. But a microcontroller like Arduino cannot measure such high values of voltage; it can only measure voltage from 0-5V. So we have to map (convert) the voltage range of 0-24V to 0-5V. 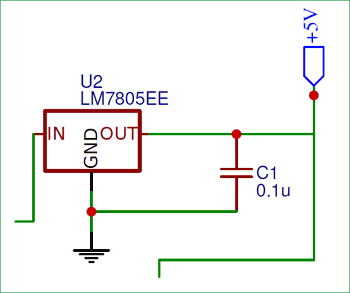 This can be easily done by using a potential divider circuit as shown below. The resistor 10k and 2.2k together forms the potential divider circuit. The output voltage of a potential divider can be calculated using the below formulae. The same be used to decide the value of your resistors, you can use our online calculator to calculate value of resistor if you are re-designing the circuit. The mapped 0-5V can be obtained from the middle part which is labelled as Voltage. This mapped voltage can then be fed to the Arduino Analog pin later. Here the value of shunt resistor (SR1) is 0.22 Ohms. As said earlier we are designing the circuit for 0-1A so based on Ohms law we can calculate the voltage drop across this resistor which will be around 0.2V when a maximum of 1A current is passing through the load. This voltage is very small for a microcontroller to read, we use an Op-Amp in Non-Inverting Amplifier mode to increase the voltage from 0.2V to higher level for the Arduino to read. The Op-Amp in Non-Inverting mode is shown above. The amplifier is designed to have a gain of 21, so that 0.2*21 = 4.2V. 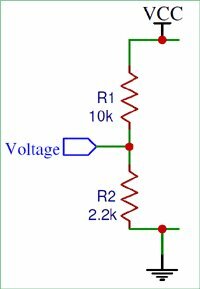 The formulae to calculate the gain of the Op-amp is given below, you can also use this online gain calculator to get the value of your resistor if you are re-designing the circuit. Here in our case the value of Rf is 20k and the value of Rin is 1k which gives us a gian value of 21. The amplified voltage form the Op-amp is then given to a RC filter with resistor 1k and a capacitor 0.1uF to filter any noise that is coupled. Finally the voltage is then fed to the Arduino analog pin. The last part that is left in the measuring unit is the voltage regulator part. Since we will give a variable input voltage we need a regulated +5V volt for the Arduino and the Op-amp to operate. This regulated voltage will be provided by the 7805 Voltage regulator. A capacitor is added at the output to filter the noise. As you can see the Voltage pin is connected to Analog pin A3 and the current pin is connected to Analog pin A4. The LCD is powered from the +5V from the 7805 and is connected to the digital pins of Arduino to work in 4-bit mode. We have also used a potentiometer (10k) connected to Con pin to vary the contrast of the LCD. Now that we have a good understanding of the hardware, let us open the Arduino and start programming. The purpose of the code is to read the analog voltage on pin A3 and A4 and calculate the Voltage, Current and Power value and finally display it on the LCD screen. The complete program to do the same is given at the end of the page which can be used as such for the hardware discussed above. Further the code is split into small snippets and explained. So to improve the accuracy we can plot of set of measured ADC values with actual vales using a known set of values and then use that data to plot a graph and derive the multiplier equation using the linear regression method. 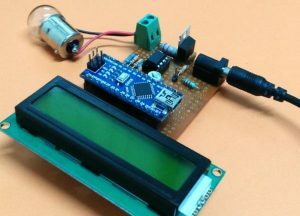 You can refer the Arduino dB meter in which I have used a similar method. For the sake of tutorial I have used a perf board to solder all the components as shown in the circuit. I have used a Phoenix screw terminal to connect the load and normal DC barrel Jack to connect my power source. The Arduino Nano board and the LCD are mounted on a Female Bergstik so that they can be re-used if required later. 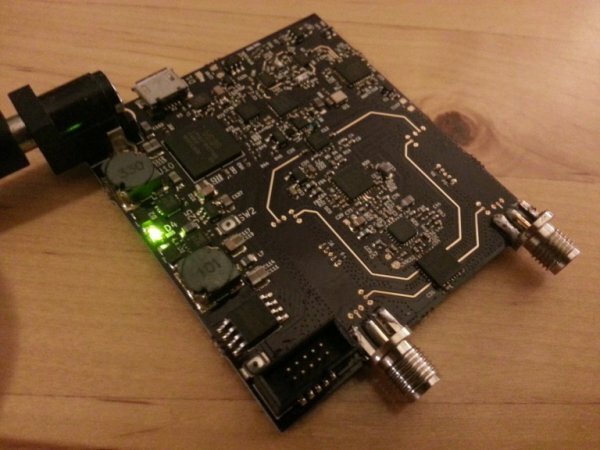 After getting the hardware ready, upload the Arduino code to your Nano board. Adjust the trimmer pot to control the contrast level of the LCD until you see a clear intro text. To test the board connect the load to the screw terminal connector and the source to the Barrel jack. The source voltage should be more than 6V for this project to work, since the Arduino required +5V to operate. IF everything is working fine you should see the value of Voltage across the load and the current through it displayed in the first line of the LCD and the calculated power displayed on the second line of the LCD as shown below. The fun part of building something lies in testing it to check how far it will work properly. 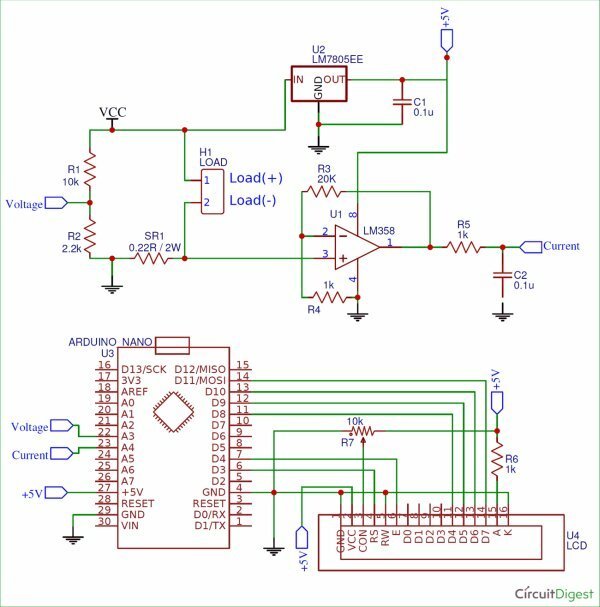 To do that I have used 12V automobile indicator bubs as load and the RPS as source. 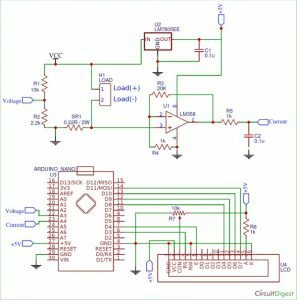 Since the RPS itself can measure and display the value of current and voltage it will be easy for us to cross check the accuracy and performance of our circuit. And yes, I also used my RPS to calibrate my multiplier value so that I get close to accurate value. The complete working can be found at the video given at the end of this page. Hope you understood the circuit and program and learnt something useful. If you have any problem in getting this to work post it on the comment section below or write on our forums for more technical help.